(Reuters) - Amazon.com Inc's (:AMZN.O) march in retail and cloud computing showed no sign of slowing on Thursday, as the company reported a surge in first-quarter profit and a rosy outlook for the spring, surprising all but the most optimistic on Wall Street. The world's largest online retailer also announced it was increasing the price of an annual U.S. Prime membership to $119 from $99 starting May 11 for new members and June 16 for renewing members. In addition, Amazon and the U.S. National Football League announced a deal to stream Thursday night games during the 2018 and 2019 seasons on Amazon's Prime Video. Amazon's shares rose 6 percent in after-hours trade. Seattle-based Amazon is winning business from older, big box rivals by delivering virtually any product to customers at a low cost, and at times faster than it takes to buy goods from a physical store. It acquired Whole Foods Market for $13.7 billion last year to help it send groceries to shoppers' doorsteps. Amazon's results bucked expectations that it would plow more profit into investments, as it has done in the past. Amazon said net income rose to $1.6 billion, or $3.27 per share in the quarter ended March 31. Analysts on average were expecting $1.26 per share, according to Thomson Reuters I/B/E/S. Sales rose 43 percent to $51.0 billion in the quarter, beating analysts' average estimate of $49.8 billion. The fast ascent of Amazon and its Chief Executive Jeff Bezos, now the richest person in the world, has drawn the attention of U.S. President Donald Trump. Writing critical Twitter posts about Amazon and the Washington Post, which Bezos privately owns, Trump has claimed without evidence that Amazon has not paid enough money to the U.S. Postal Service to cover delivery costs. Success is "the best revenge that Bezos can get against the administration for its veiled threats about sales taxes and not paying its fair share," said Wedbush Securities analyst Michael Pachter told Reuters on Wednesday. In addition to announcing an increase in the price of yearly Prime memberships, Amazon previously increased fees for U.S. Prime members on month-to-month plans, affecting some 30 percent of subscribers by Cowen & Co's estimate. Sales from Prime fees and other subscriptions grew 60 percent to $3.1 billion. "We still feel it's the best deal in retail," Brian Olsavsky, Amazon’s chief financial officer told a conference call, adding the number of items eligible for free two-day shipping increased in recent years from 20 million to more than 100 million. Revenue from third-party sellers paying to promote their products on Amazon.com was an unusually large bright spot during the quarter. Advertising and "Other" sales, including from co-branded credit cards, grew 139 percent to $2.03 billion. Amazon's stock has outperformed the S&P 500 (.SPX), rising 30 percent this year as of Thursday's market close, compared with the S&P's less than 1 percent decline. Its shares trade at a premium to many peers. The stock's price-to-earnings ratio is more than 11 times that of cloud-computing rival Microsoft Corp (:MSFT.O). Amazon Web Services (AWS), which handles data and computing for large enterprises in the cloud, saw its profit margin expand in the quarter. It posted a 49 percent rise in sales from a year earlier to $5.44 billion, beating the average estimate of $5.25 billion, according to Thomson Reuters I/B/E/S. "That business continues to grow very well and has seen great customer adoption," said Amazon's Olsavsky on a call with reporters. Amazon continues to invest in a wide array of areas. The company plans to spend more on video content this year, including its renewed deal to stream Thursday Night Football games and a prequel television series to "The Lord of the Rings" in the works. Wedbush's Pachter estimated that content spending will be $6 billion or more this year, up from $5 billion in 2017. 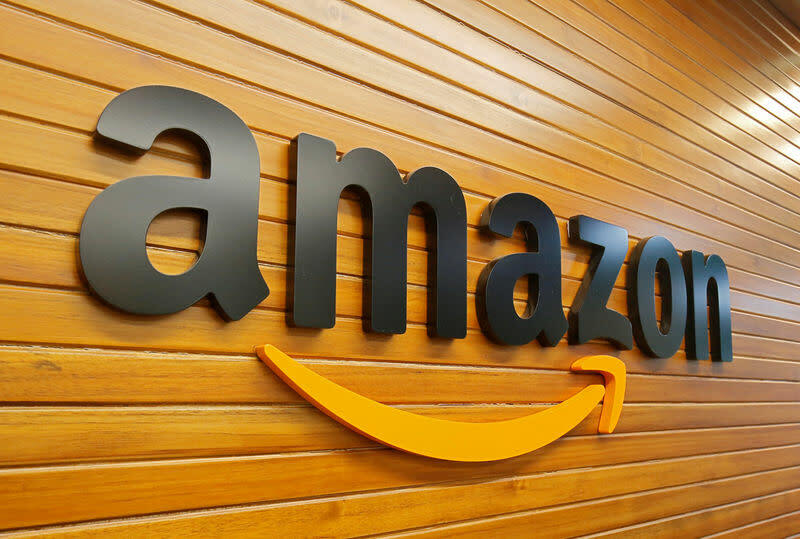 Earlier this year, Amazon announced a partnership with JPMorgan Chase & Co (:JPM - News) and Berkshire Hathaway Inc (BRKa.N) to determine how to cut health costs for hundreds of thousands of their employees. And Amazon is expanding its retail footprint outside the United States, particularly in India. Its international operating loss grew 29 percent to $622 million in the first quarter. Amazon's global headcount is up 60 percent from a year ago at 563,100 full-time and part-time employees, thanks to a hiring spree and an influx of workers from Whole Foods Market.